In nonhigh risk patients with hypertrophic cardiomyopathy (HC), the presence of extensive late gadolinium enhancement (LGEext) at cardiovascular magnetic resonance (CMR) imaging has been proposed as a risk modifier in the decision process for implantable cardioverter defibrillator implantation. With a pretest risk of about 10%, a strategy that alters the likelihood of LGEext could markedly affect efficacious CMR imaging. Our aim was to study the potential of clinical variables and biomarkers to predict LGEext. In 98 HC patients without any clear indication for implantable cardioverter defibrillator implantation, we determined the discriminative values of a set of clinical variables and a panel of biomarkers (hs-cTnT, NTproBNP, GDF-15, and Gal-3, CICP) for LGEext, that is, LGE ≥15% of the left ventricular mass. LGEext was present in 10% (10/98) of patients. The clinical prediction model contained a history of nonsustained ventricular tachycardia, maximal wall thickness and reduced systolic function (c-statistic: 0.868, p <0.001). Of all biomarkers, only hs-cTnT was associated with LGEext, in addition to the improved clinical model of diagnostic accuracy (p = 0.04). A biomarker-only strategy allowed the exclusion of LGEext in half of the cohort, in case of a hs-cTnT concentration less than the optimal cutoff (Youden index; 8 ng/L—sensitivity 100%, specificity 54%). In conclusion, in this nonhigh risk HC cohort, the pretest likelihood of LGEext can be altered using clinical variables and the addition of hs-cTnT. 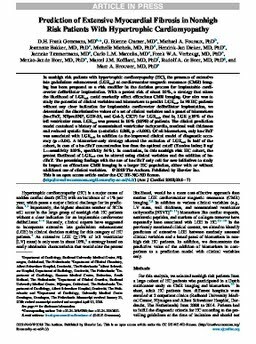 The promising findings with the use of hs-cTnT only call for new initiatives to study its impact on efficacious CMR imaging in a larger HC population, either with or without additional use of clinical variables.